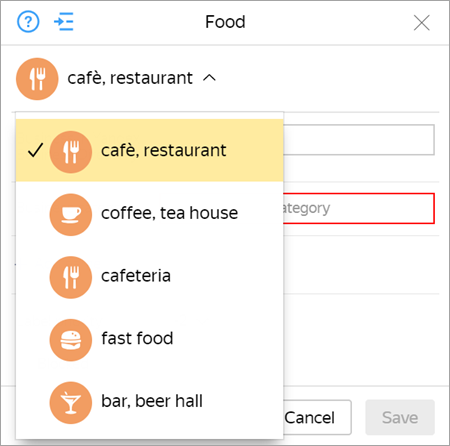 When you create a “Location” item (usually an organization), a category selection menu appears. 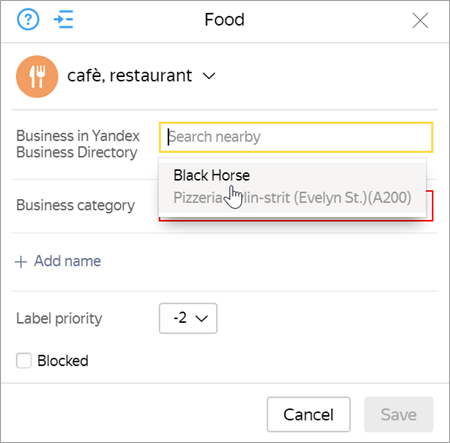 Information about the type and location of “Food” items is stored in Yandex.Maps. All the other information about these items (operational hours, contact information, etc.) is stored in the Yandex Business Directory (our online catalogue for various organizations). Yandex Business Directory block (status, operational hours and dates, website URL, Email, Phone number). When creating a new item, only the fields in the Yandex Map Editor block should be edited (see section 3.6.3.1. Yandex Map Editor block). 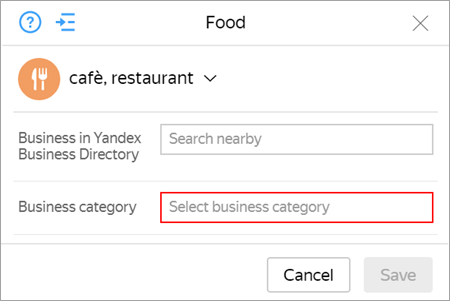 When editing the Yandex Business Directory block (see section 3.6.3.2. the Yandex Business Directory block) the suggested edits will then have to be checked by the Yandex Business Directory moderation team. You can see the edits' examination status in the edit list (see section 2.10.10. Notifications for authors). Click Save after setting the attributes' values. The item will then be saved on the map. If you try to edit the newly created item, an extra block titled Information from the YBD will appear. (see section 3.6.3.2. the Yandex Business Directory block). with the organization's entry in the Yandex Business Directory. If the organization you're looking for is not in the list, enter its name in the Name field (see below for more information). If the organization's line of business fits into several categories, select the one that matches their main business. For instance, if a clothing store also sells some shoes on the side, their main category should still be “clothing store”. If you can't determine what an organization's main line of business is, try getting as close as possible and entering one of two suitable categories. Only the item's proper name in cases where the item name doesn't include the type name and fully fits its own category. For such cases, you should also enter the “Also known as, historical” name variation, which consists of [the object's type + the objects proper name]. The item's proper name and item type in cases where the item's proper name grammatically overlaps with the item type (including numbered items), or if the item type doesn't fully fit its own category. Only the item type for cases when the item doesn't have its own proper name. Only the item's proper name if it doesn't grammatically overlap with the item type, even if the caption name coincides with the official one (this includes items that have both a proper name and a numbered label). The item's proper name and item type in cases where the item's proper name grammatically overlaps with the item type, or if the item type doesn't fully fit its own category. Only the item type for cases when the item doesn't have its own proper name and the item type doesn't match the category. It doesn't need the For caption on map name if the item type matches the category. 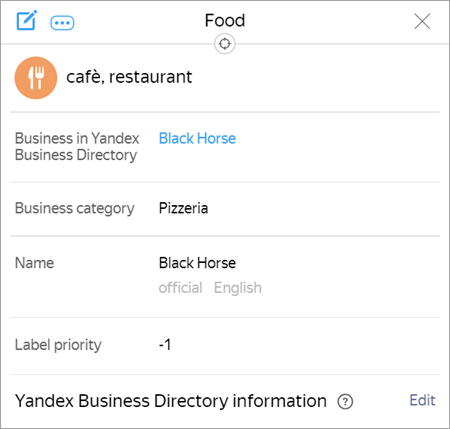 After saving the item on the Yandex Map Editor, you can start editing its Yandex Business Directory attributes. Hours displays an organization's opening and closing hours. The time should be set in the HH:MM format. 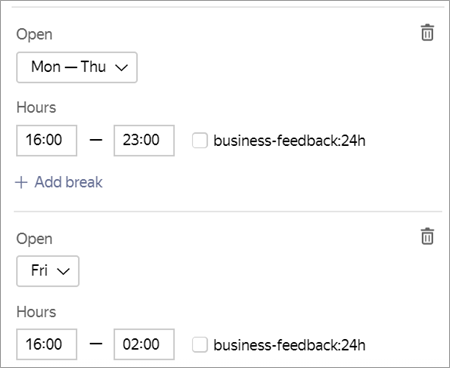 If an organization works 24 hours a day, select the 24 hours toggle. Click the Add break line to open two extra fields. 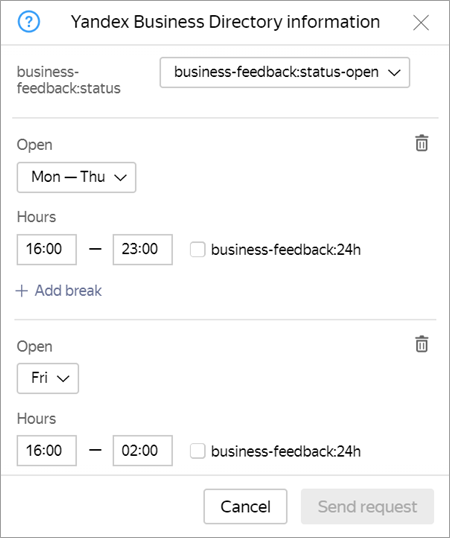 Here you can set the start and end of an organization's break hours, if applicable. Use the HH:MM format. Specify an organization's URL address in the Website field (see section 3.6.2.2.6). Website: click Add to specify any subsequent values. Specify an organization's Email in the Email field (see section 3.6.2.2.7). 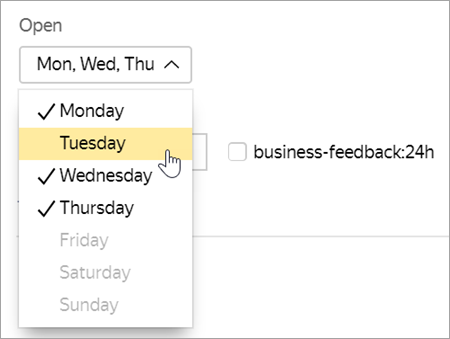 Email: click Add to specify any subsequent values. Specify an organization's phone number in the Phone number field (see section 3.6.2.2.8). Phone number: click Add to specify any subsequent values. Click Send suggestion. All added or edited information will be sent to the Yandex Business Directory. The suggested changes will then be examined by the Yandex Business Directory moderation team. You can see the edits' examination status in the edits list (see section 2.10.10. Notifying authors). The organization's card will still be displaying outdated information until the moderation process is completed. After the suggested information goes through the moderation process, the organization's card will be updated and the new information will finally appear on Yandex.Maps.